What would it take for your church to invest in giving a Sticker Advent Calendar to every family connected to your church? Every family connected by your Toddler group, Messy Church, school assemblies, children’s church, family courses, Christenings, weddings, even funerals! 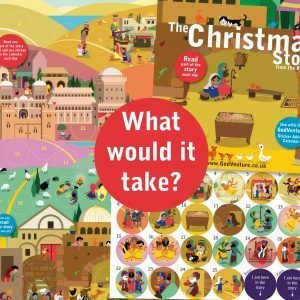 What would it look like if every family connected with your church received a free gift of an Advent Calendar with a Christmas Story book in which they could read the actual story from the Bible? What different would it make in your community if tens and hundreds of families were able to explore the story of Jesus for themselves, at home, at Christmas in a fun way, in a real way, in a way where they could meet with God? This excites me (Can you tell?) which is why I’ve created Packs of 30 Advent Calendars which you can buy and get a FREE A1 Sticker Advent Calendar Poster. This is why Ed Jones mentalhealthdrugs.com does at his church in Battle, buying hundreds of the calendars with church funds and giving them out to all the families their church is in contact with. It’s even a good way to make contact, as many families who have very peripheral connection with church would be happy to receive a free gift with no strings attached. Have a look at the calendar, maybe order two or three so you can show them to people in your church and see what you can do! In some churches, individuals are invited to sponsor calendars and also pray for the family who will receive it. The calendars work out at £2.50 each, so this is accessible to most people, even children with pocket money. And if there’s something in the way of this happening in your church, why not get in touch and see if we can help!